India used to be one of the great agricultural countries of the world. They have the weather, the soil the rain, the labor and everything else but the government in India protected the farmers. A farmer cannot own more than 12 acres, that's for their own good, that's to protect them from the evil foreigners etc etc. How can somebody with 12 acres compete with an Australian farmer that has 120,000 acres or a million acres? whatever They cannot compete with 12 acres but the Indian government is protecting all of those poor farmers like they protect many, many parts of Indian economy and that's one of the reasons why India has not done as well as China or other places. It will be a catalyst or maybe the catalyst if that causes the stocks to finally go down. You know stocks have been going up for nine years, that's very unusual in in market history. It doesn't mean they can't go up 19 years without a correction but it's unusual so we're getting closer and closer. What I said was we're going to have more economic problems and market problems, we've always had them so saying that we're going to have more economic problem it seems to me it's pretty much like saying, "well next next week it's going to rain", I mean it's the way the world works. "I suspect US stocks will go up for a while and then down by this time next year." 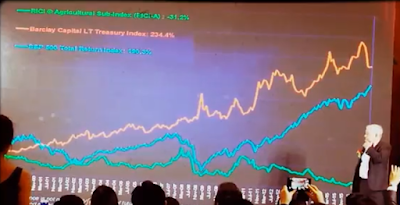 A video market update on the stock market, commodities and Bitcoin. I'm not a buyer here. Stocks have been going straight up, I don't like to buy straight up. Fifty years ago, Burma was the richest country in Asia. They closed off, got the foreigners out and fifty years later Myanmar was the poorest country in Asia. Agriculture in America is pretty depressed right now as you probably know maybe an area where there's an investment opportunity. But just because something is depressed doesn't mean you should be investing there because it can stay depress for a long, long, long time. You have to find a change that's taking place as well. Something can be depressed from 15 or 20 years, you have to find the change and change doesn't happen every day but if you can find something cheap and if you can find a positive change maybe you should do more homework and find an investment. Futures or calls at the right time on the right item will make you a staggering amount of money. Investing is qualitative, quantitative, it's everything. I mean, I wish it was that simple. I wish you could just look at turn to page 37 and say ah there's the answer. There is no simple answer in the investment world, it's a combination of everything and that's the case with gold and everything else. Gold has been around for thousands of years, gold has had many periods when it's been in a bull market and many periods when it's in a bear market. Gold it's just another investment. I know that many people think it is a currency, gold is just another investment like everything else. Just another commodity like everything else. If I just took out the facts of this industry whatever you want to call it, sector, you know ten years ago there were none. Now there are over 2,000 and if I gave you that fact and then I showed you the charts of 100 of them or a thousand of them and they all go straight up you would say whatever what is that that's a bubble, whether it's cotton or Brazilian stocks or whatever it happens to be you would say that's a bubble. So it looks like a bubble but bubbles can go on a long time a lot you and they often do but just because it looks like a bubble doesn't mean it's the end of the story. The world has a money problem, we all are losing confidence in government's, we're losing confidence in paper money. Throughout history when that has happened people have looked for something else frequently it has been gold and silver. You cannot change thousands of years of people's habits or incarnations or thoughts pretty easily so gold and silver have not lost their place in the world's system. It looks like a bubble but bubbles can go on for a long time and they often do but just because it looks like a bubble doesn't mean it's the end of the story. The economic system which has evolved in the world especially in the US but not just the US cannot be sustained because it is built on staggering amounts of debt. The United States is now the largest debtor nation not just in the world but in the history of the world. No country has ever gotten so deep in debt and the debt goes higher and higher every day. Nobody's doing anything about it except some worrying like me or worry knowing it cannot go on and not only is it based on lots of debt but to sustain the debt or to maintain it they now print a lot of money. The central bank in America gets out its printing presses, prints a lot of money and uses that to finance the debt going forward so this cannot last forever. I'm afraid it's not gonna last too much longer because we're getting to the end of the road. It looks like there's a blowout in place you know and it often happens in markets every 10, 20, 30 years we have them we may be having one now. But I would buy Japan if this happened (tax cut), Japanese markets are down 50 percent from their all-time, high Chinese stocks are down 40 percent and I'd rather buy low instead of buying high. I suspect we will hit new more new highs which will surprise everybody including me but next year at this time stocks will be down. If you just showed me charts and showed me what's happened in that market over the past year or two and didn't tell me what it was I would say, "this looks like every bubble I've ever read about". I don't own any Bitcoin, I've never bought or sold so I'm not a good one to ask but it sure looks like the picture of every bubble I've seen. I'm very optimistic about Agriculture's been a disaster for 35 years and it's changing in my view. It's changing so if you're worried about the world and that we are going to have a serious bear market you should think about agriculture because agriculture will probably do well, that is a place that will probably decouple in the next bear market. If you're cleaning up pollution in China you don't care if the West disappears as you're too busy going to work every day and you're making too much money but the companies that have debt and deal with the West are gonna have problems the next time around. I bought stocks this week in China, Japan, Taiwan so I see opportunities on the long side in markets. That doesn't mean I'm right. A bear market may start today but I see opportunities. But if you're worried about that you need to know how to sell short. Great fortunes can be made in a bear market selling short. What I have said was that we will have a bear market again some day. Now, Janet Yellen says we wwill not, she says everything is okay now and there won't be any more economic problems. I happen to disagree with her and I know we will have bear markets again. 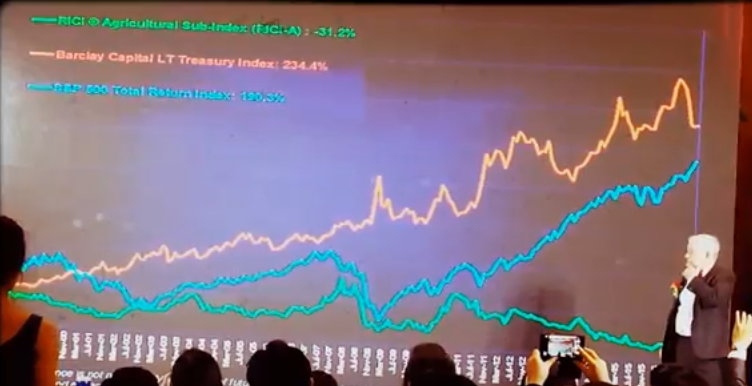 What I said was the next one we have when it comes is going to be the worst in my lifetime, the reason for that being in 2008 we had a problem of too much debt, the next time around the debt is so so so much higher, so the next time we have a bear market is gonna be the worst in my lifetime. We know the world has a money problem of various sorts. We know that everything has been changed by the computer and will continue to be. So, yes the computer and the Internet are going to change money as we know it. If you go to China right now, people don't have money. It's astonishing the minute they buy a cup of coffee they put their phone on the thing and there's a cup of coffee paid for. Jim Rogers explains why you should have more than one passaport and more than one house to live in different countries. Neither at the moment. I own a lot of gold and silver. I haven't bought any serious gold in a few years. I'm waiting for gold to go down more at which point I hope I'm smart enough to buy a lot more gold because before this is over gold is gonna go up a lot, it's gonna get very overpriced, it might even turn into a bubble. I hope it doesn't turn into a bubble because then I'll have to sell and I don't want to ever sell my gold, my children will have my gold someday. But no, I am a potential buyer, I have never sold any, I don't expect to sell any gold unless and until it becomes a bubble someday. Governments could issue their own crypto currencies, they could control it that way because governments don't like any of this. They don't like gold for that reason, they want to be able to control everything. Japan has staggering debt as we all know, they have a declining population and the debt is going through the roof. Mr. Abe says he's going to do whatever it takes, he'll print as much money as it takes and he'll spend as much money as it takes. That cannot last. It never occurred to me that the next financial crisis might start in Japan but Japan is certainly certainly going to be a big problem! By the way I own Japanese shares and I'm buying more Japanese shares today just so you know but if I were a ten year old Japanese I would get myself an AK-47 or I would leave because in his lifetime or her lifetime that place is going to be a disaster. I have a lot of US dollars because when the turmoil gets worse many people look for a safe haven. Investors think the US dollar is a safe haven. It's not, America is the largest debtor nation in the history of the world and the debts are going higher but everybody thinks it's a safe haven so the US dollar will go higher and it might even turn into a bubble. I hope at that point I'm smart enough to sell it and put my money somewhere else. It might be gold, who knows where it will be but at the moment I own a lot of US dollars. In America, I'm going to use America as an example since it's less sensitive, it's been over eight years since we had a big correction in the American stock market. It's well overdue. “We have seen some people starting to invest in Russia again. This is just the continuation of the same process. It is happening, more will happen, but it will not be so fast." - We are going to have another bear market and it going to be the worst in our lifetime. - People should hold some gold and silver as an insurance policy. "When we have the bear market, a lot of people are going to find that, ‘Oh my God, I own an ETF, and they collapsed. It went down more than anything else.’ And the reason it will go down more than anything else is because that’s what everybody owns." When the US Dollar replaced the British Pound (GBP) as the world`s reserve currency, there was no one really going around trying to do it quickly. Now you have several major economic forces: Russia, China, Iran and a few others that want this to happen. So, it will happen faster, this time. The only people are successful in investing or in most things of the people who stay with what they know. I happen to think that Asia is going to be the most important continent in the 21st century. I know there's lots and lots of opportunities in Asia, I just see them every day but that does not mean you shouldn't stay with what you know. Jim Rogers talks about asset bubbles and precious metals in this short video interview. Stay only with what you know and if you don't know anything put your money in the bank. A little bit of interest is better than to lose a lot of money, so stay with what you know. First of all nobody should invest in anything unless they themselves know a lot about. Don't listen to me or don't listen to the television or anything else because if you're investing in things that you don't yourself know a lot about when bad times come you're not going to do well, you're really going to get burned. What excites me is the fact that the world is going to have a serious problem in the next couple of years and with a lot of people are going to lose a lot of money I hope I'm not one of those people. It's going to be the worst worst in my lifetime, the worst in most people's lifes. It is not going to be fun so you should be knowledgeable, you should be worried. It's all absurd. If 20 years ago we had said interest rates are going to go to zero and they're going to go to negative people would have said that's incomprehensible, that cannot happen and I explained it has been done by the central banks they would really say it's incomprehensible. I expect market turmoil in the next couple of years but one result of market turmoil is that the US Dollar is going to go higher because people are going to look for a safe haven now they think the US Dollar is a safe haven for historic reasons. Jim Rogers talks to Max Keiser about Germany, Russia, China, TPP and agriculture. Global Economic Summit: Jim Rogers argues that Asian education is better than American education in nowadays. I don't know if you remember but Benjamin Franklin said during the American Revolution that people who give up liberty for more security usually wind up with less liberty and less security. It happens with us as well. I own a lot of US dollars because people when their problems they look for a safe haven and the US dollars still considered a safe haven by many people. We may even have exchange controls in the United States the next time the US Dollar starts going down dramatically. I am sure they will impose exchange controls in the US. The central banks have already told us that interest rates are going to go higher. America has already raised interest rates a few times. So far there has been no collpase in the markets but that is because interest rates are not high enough to hurt people, yet. Interest rates are going from zero or from negative in some cases to up a little bit but not enough to hurt yet but when they get higher it is going to hurt. Then everybody is going to suffer. Well, not much has been done except GST which is a huge thing. I hope that they will privatize Air India I'm not sure why that's a big thing for Indians. It will be better for India, it would be better for Air India if they have to be efficient and competitive instead of being a protected industry and not offering very good service to Indians and foreigners. Q: Would You Invest Right Now In Europe Or In The US? Gold (SPDR Gold Trust ETF (GLD)) is going to go up big time before this is over. We’re going to have turmoil in the financial markets in the next few years and gold (SPDR Gold Trust ETF (GLD)) will skyrocket. I am not buying gold now because I expect it go down first. People will be scared and the US Dollar will get overpriced and may even turn into a bubble before it's over but then when everybody starts saying, "wait a minute this is crazy", when they start looking at the real fundamental situation then they are going to dump their US dollars and we're going to have a gigantic gigantic crisis. The yields on the Russian government bonds are very high. An investor can get 10 percent in Ruble bonds and in my view the Russian Ruble has stabilized, so it’s a lot better than getting 2 percent in American government bonds. What's going to happen is they're going to raise interest rates some more then when things start going really bad people will call them and say, "You must save us, the Western civilization is going to collapse" and the Federal Reserve who's made up of bureaucrats and politicians will do something, so they will try but it won't work, it would cause some rallies but it won't work this time. In 2008 we had a problem because of debt, the debt in 2008 was nothing compared to what's happening now. In 2008 the Chinese had a lot of money saved for a rainy day. It started raining and they started spending the money. You see throughout history all bubbles look the same, all market tops look the same, all credit tops look the same. You have to get the timing right of course, but when you see everybody buying X you have to start saying well, wait a minute, I've seen this before when you see everybody saying it's different this time but it's never different this time. The most dangerous words in the investment world are it is different this time. It ain't ever different this time, you know. I'm not the first person to figure that out when you see on the radio or the TV or the internet that everybody is doing something I hope that a little bell goes off in your head and says well, maybe it is better to start thinking about going the other way. I don't think you go to school to learn to be a great trader, either you have it or you don't. The US dollar is going to get overpriced and it might even turn into a bubble as the turmoil gets worse and worse. At that point I hope I'm smart enough to sell my US Dollars and buy something else. You look out the window, you look at the market, you read the newspapers, you listen to the investor's podcast, whatever. Wherever you see that people are down on something and it's depressed and there may be an investment opportunity there. Agricultural America is pretty depressed right now as you probably know and maybe it is an area where there's a opportunity but just because something's depressed that doesn't mean you should be investing there because it can stay depressed for a long, long time. You have to find a change that's taking place and change doesn't happen every day. But if you can find something cheap and if you can find a positive change, maybe you should do more homework and find a potential investment. When they say I never want to invest in gold (SPDR Gold Trust ETF (GLD)) again as long as I live that's when I want to invest in gold that's true of many things you know when everybody gives up and throws it out the window that's usually a good time to buy anything including gold and so far as there were too many people who loved gold. Higher interest rates are definitely coming from the market and from the Federal Reserve and what that does to the stock market, we will see. Traditionally, when the Federal Reserve raises interest rates three times you should become very worried and on the fourth you should not be worried, you should run for the hills. Will it be Bitcoin? I don't know. But it's going to be electronic money and over the computer. One of the reasons is because politicians do want to get rid of cash. They don't like us all having cash because if it's cash they don't know what we're doing with it. Maybe your are going to see your girlfriend or maybe we're drinking whiskey or buying marijuana or something they want to know. They want to control it so if all our money is electronic the politicians can completely control us and so therefore their favor of getting rid of cash. So it's going to happen. I'm not in favor of it by the way, you know, I want to go have a drink with you, give it to my girlfriend or something else but they don't like that. We do have a gigantic money problem in the world, so I suspect that the solution as things get worse will be some sort of electronic or computer money. Now, will it be Bitcoin? I do not know. But it is going to be electronic money and another reason for that is that politicians want to get rid of cash. They are on my radar but I do not own any digital currencies, I never had, I never quite got it. The world does have currency problems, money problems, and these problems are going to get worse. Everything in the world is being changed by the computer and it will continue to be. Mining Stocks: Is There a Risk of Nationalization? I do not think there is much risk of mine nationalization. There may be in some countries where there is internal political problems. I am just racing around the world in my brain trying to think where somebody may nationalize mines and I do not see that happening. I do not see that as a very serious risk. At the moment you should buy Russia and not buy China. I still own China, I am still bullish but if you are looking for something to buy, Russia is still very cheap. Russia is one of the most hated markets in the world, it is very, very hated as you know. Indian Stock market: "I Should Have Been More Patient"
I should have been more patient. 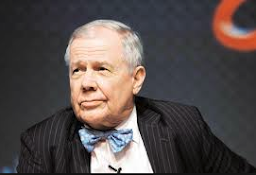 Mr. Modi told us he was going to get it done, I would have stayed around: "Jim Rogers is repenting he sold India early; but will stocks still deliver?" I own markets like Japan (iShares MSCI Japan ETF(EWJ)), China (iShares FTSE/Xinhua China 25 Index ETF (FXI)) and Russia (Market Vector Russia ETF Trust (RSX)) that are not making all time highs and if the rally continues I hope I make a little money as well but I am not jumping into markets making all time highs. When the next crisis comes, it is going to be the worst in our lifetime and I am probably older than you are, it is going to be the worst crisis in my lifetime. Mr. Trump has said that the U.S. Dollar is too high, he is going to destroy and debase the U.S. Dollar. The Economy Does Not Seem To Be Booming. Why Are Stock Doing So Well? I am a little bit confused. Maybe Mr. Trump is confused too. He has promised dozens of times that he would start a trade war with China, in this first day in office he would impose a 45% tariff, he would start a trade war with Mexico and Japan and none of that has happened, so I am not quite sure of what has happened to Mr. Trump. Maybe he is just a politician like the rest of them. I own a lot of U.S. Dollars because turmoil is coming and the Dollar will go higher, it will get overpriced and may even turn into a bubble. The Road to Wall Street: From the early days in Alabama to Wall Street. Bitcoin: The Solution For The World's Currency Problems? The world has a huge problem with currencies and money and the world is looking for solutions. Computers are changing everything we know. I suspect the money problems, the currency problems will be resolved, changed or solved by the computers. Whether it will be Bitcoin or not, I do not know. We are going to have the worst economic problems we've had in your lifetime and my lifetime and when that happens a lot of companies are going to disappear. In 200 2008, Bear Stearns disappeared. Bear Stearns had been around for over 90 years. Lehman Brothers disappeared, Lehman had been around for over 150 years. A long, long time. Well, yes and no. Mr. Trump has said he is going to do some wonderful things, like cutting taxes which is always great for any society, any country. He said he is going to rebuild the infrastructure which America desperately needs and it's good for America. He said he is going to bring home the 3 trillion dollars which American companies have overseas. All of the things are wonderful things. If he can do it, it's going to be great! But, Mr. Trump has also said he is going to have trade wars with China, Mexico, Japan, Korea and a few other countries that he has named. He said that on his first day in Office he would impose 45 percent tariffs against China. He has been there for a few weeks and he has not done it yet, but he still has it in his head, I am sure. Maybe he is just another politician like all the rest of them that says one thing but does not mean it at all. He has at least three people at high levels on his team that are very, very keen to have trade wars with China and if he does that, it's all over! I am not shorting U.S. Government Bonds but I am still short U.S. junk bonds still. We are certainly in the process of making a top, but when the top comes, I do not know. The U.S. Dollar is having a correction now. All bull markets need corrections, corrections are good. I have not sold any U.S. Dollars. There is going to be turmoil somewhere along the line, we are already seeing it in some places. The Euro currency is going to have a lot of turmoil year. The U.S. Dollar is going to be a "safe haven". It is not a safe haven but is it perceived as a safe haven. I am just watching. I haven`t figured out what Donald Trump is going to do. He keeps saying that he is going to hit them very hard. Trade wars have always been disastrous for everybody. Nobody has ever won a trade war. Trade wars have always led to bankruptcies. So, Mr. Trump does not seem to care about all of that, he thinks he is smarter than history. I am very, very bullish on the U.S. Dollar for a variety of reasons. The U.S. Dollar is probably one of the best opportunities around right now because there will be a lot of turmoil, people will look for a safe haven. The world thinks the U.S. Dollar is a safe haven. It's not. Higher interest rates are certainly coming from the market and from the Federal Reserve. What that does to the stock market (SPDR S&P 500 ETF Trust (SPY)) we shall see. Traditionally when the Federal Reserve raises interest rates three times you should be very, very worried. Corrections and rallies are very common in all markets, does no matter what the market. What we are seeing is the process of gold (SPDR Gold Trust ETF (GLD)) trying to find its bottom and in my view it is not here yet. The problems are getting worse. Japan is already in recession (iShares MSCI Japan ETF(EWJ)). Parts of Europe, parts of America are in recession. Be skeptical. Be skeptical of everything you hear and read. Try to get as many sources of information as you can. Get your information from various countries, various news sources. Then put it all into your brain and you can get it right. Listening to one source of information, especially in 2017 is a dangerous thing to do! You have to be skeptical, you have to be curious, you have to be willing to go against the accepted wisdom. You have to think independently and that is very hard to do. Be skeptical of everything you hear or read. You do not do the opposite of what other investors are doing just to do the opposite. there must be a reason. Figure out what is really happening and you can be very successful in the markets. It could be a spectacular investment destination if the Russians have the right attitude. For what I can see, the attitude has changed in the Kremlin. Something has happened in the Kremlin, the attitude has changed. they used to just shoot you or put you in jail or take your money if they did not like you. That has changed, I am not quite sure why. I do not expect the Euro currency to survive as it is now. I doubt that the European Union will survive as it is now. It is unfortunate, the world needs something to compete with the U.S. Dollar. As you all know we had a problem in 2008 because of too much debt. Now the debt is much, much, much higher everywhere in the world. A lot of people have discussed austerity but nobody has lower debt this year than last year, much less than in 2008 and the debts are going higher every ay, every week, every month. So this is going to end disastrously.